Shahabuddin, the dreaded 50-year-old politician convicted in eight criminal cases and awaiting trial in over 30 others, was first taken out of Siwan jail early in the morning. PATNA: Convicted criminal-turned-politician and former RJD MP Mohammad Shahabuddin was on Saturday shifted from Siwan jail in Bihar to Tihar Central Jail in Delhi amid tight security as per the order of the Supreme Court. 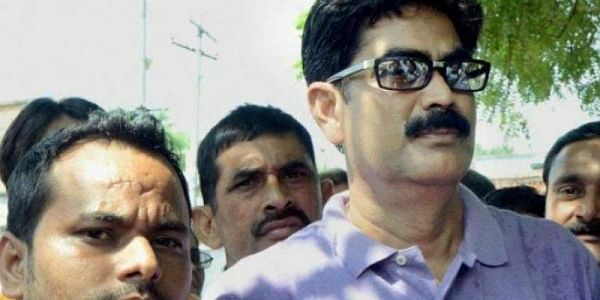 Shahabuddin, the dreaded 50-year-old politician convicted in eight criminal cases and awaiting trial in over 30 others, was first taken out of Siwan jail early in the morning and brought to Beur Central Jail in Patna amid tight security. He was taken out of the Beur jail at 4 PM and taken to Rajendranagar railway station in Patna, where he boarded Sampoorna Kranti Express train along with a posse of police personnel to be taken to Delhi. A large number of supporters of the former MP had gathered at Patna Junction railway station as word had got around that he would board a train from there. But the authorities brought him to Rajendranagar station to avoid inconvenience and security risks. The authorities tried to keep the entire operation out of the media’s attention. Efforts were taken to ensure that there is no repetition of the scene of September 11 last year, when the don turned politician's emergence from Bhagalpur jail on bail was greeted with a huge gathering of his supporters. During Beur jail transit, Shahabuddin was seen greeted by two notorious criminal-turned-politicians – Mokama MLA Anant Singh of the ruling JD (U) and Ritlal Yadav of RJD, an ally of JD (U). “Singh and Yadav were very happy to know Shahabuddin was in this jail and they came out of their cells to offer their respects to the Siwan leader. The trio chatted for some time,” said a jail official. Nearly 100 of Shahabuddin’s supporters had gathered outside Siwan jail since 2 AM after learning of the district administration’s plans to shift him out. When the cavalcade of jail and police vehicles carrying Shahabuddin started off the jail, the supporters followed in nearly 20 SUVs and other cars, besides about 50 motorcycles. The authorities stopped these vehicles at one place on the way and snatched the keys of at least ten cars, thus causing an argument with some of Shahabuddin’s supporters, said an official. “He (Shahabuddin) is being shifted to Tihar jail in obedience to the order of the honourable Supreme Court. He was brought to Beur Jail from Siwan jail this morning,” said inspector general (prisons) Anand Kishore. Except the district magistrate and SP of Siwan and three senior officials including the inspector general (STF), nobody else knew about the shifting plans of Shahabuddin to ensure smooth operational procedures, he added. The Supreme Court, acting on petitions filed by a man in Siwan whose three sons had been killed allegedly by Shahabuddin’s henchmen, had on February 15 directed the Bihar government to shift Shahabuddin to Tihar jail in a week to ensure free and fair trial in the cases lodged against him. Trial of the pending cases, the top court directed, would be conducted through video conferencing.